As part of Ubisoft's live service direction new content is coming to Assassin's Creed Odyssey and it's free. 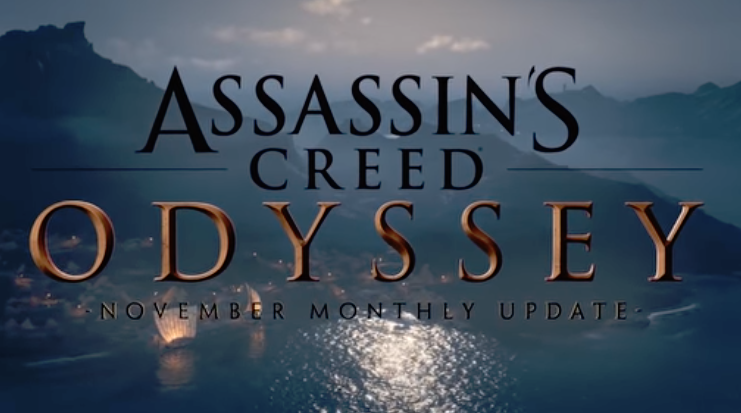 In a new video, Ubisoft detailed new content being added to the game throughout November. New quests will be added, one, in particular, has Alexios/Kassandra filling in the role of an actor in a play. Also being added is new Epic mercenaries and Epic ships to take down. All with new rewards for defeating them. A new underworld gear set, which looks incredible, will be added along with a new mount and new weapons coming later this month. Players will have a new mystical beast to do battle with. The Cyclops will be added to the game for Alexios/Kassandra to take down. Ubisoft confirmed that the level cap will be raised from level 50 to 70. Those who reached level 50 will gain all the experienced they've earned since then and added to the new level cap. Ubisoft has also reduced the materials needed to upgrade gear as per fan feedback. Assassin’s Creed Odyssey is now available for PS4, PC, and Xbox One. Assassin’s Creed Odyssey's first DLC set, Legacy of the First Blade, ended a few weeks ago. Now, the first trailer for The Fate of Atlantis has been released.